On Memorial Day, our students gain the experience of playing a significant role in meaningful public ceremonies. This year the High School Band will participate in the ceremonies in Ashfield and Plainfield, and the Middle School Band will participate in a ceremony in Colrain. Ceremonies will take place RAIN OR SHINE. In the event of inclement weather, ceremonies will take place indoors. The Ashfield Memorial Day parade on Monday begins at 10 a.m. in front of Town Hall, proceeds to Plain Cemetery and to the Veterans Memorial and Civil War Memorial, then back to Town Hall. There will be featured speakers and music as well. 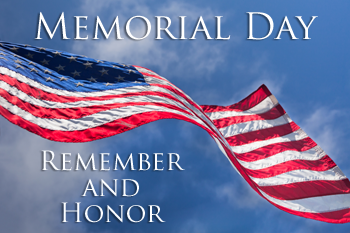 The Plainfield Memorial Day parade on Monday begins at 1 p.m.
Colrain’s Memorial Day ceremonies on Monday will begin with a parade that starts from the back of West Branch Cemetery at 10 a.m. and follows the roads around the cemetery to the bridge over West Branch River. There will be a ceremony on the bridge, followed by a parade into the cemetery for the main ceremony.